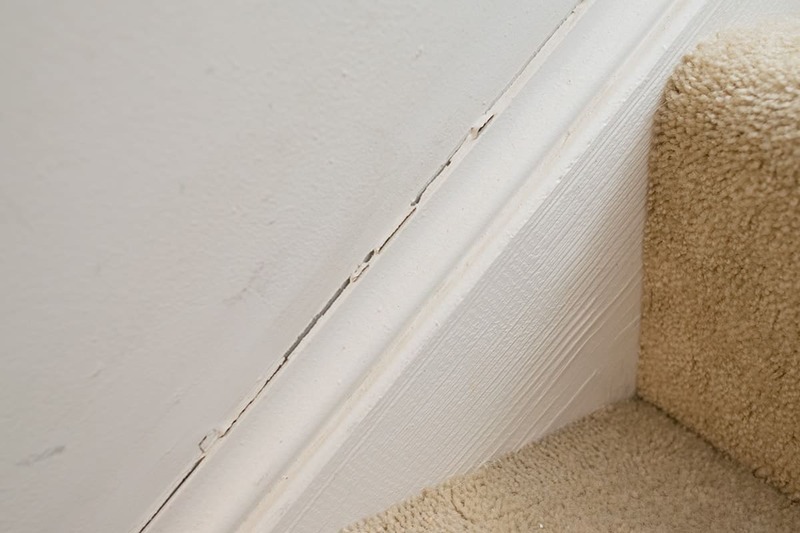 Repairing baseboards doesn’t have to be hard but those unsightly cracks and chips can build up over time as a house settles. 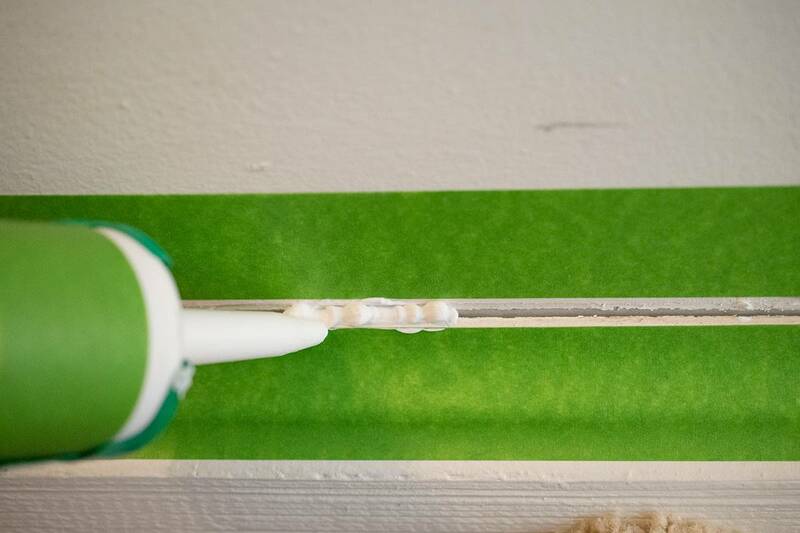 Today, I want to show you how to repair your baseboards like a pro using a caulking gun and some tape. FrogTape® asked to work with me to help make all the baseboards beautiful again. As always, all opinions are 100% mine. If there is one fact I know about older homes, it’s that the poor baseboards and trim take far more of a beating than they should. All those pretty wall pictures on Pinterest with the stunning crown molding and crisp baseboards? I have yet to move into a house like that. You name it and I have probably fixed it. I have seen dog chew marks, people paint right over dirt, and, well, let’s leave it at that. It’s really sad too because beautiful baseboards and edges really can make a wall stunning. It’s those little details that make a difference. That’s ok, we can fix it! It all starts with some tape and a caulking gun. So I will start out with my usual disclaimer: we bought a fixer-upper and the walls were riddled with scratches and scrapes. I take no responsibility. Although most of the house is painted, we have a staircase that still stands as a reminder of how far we have come. I think it is time to let that go. Both sets of stairs were badly cracked, but the baseboards themselves seemed to be in decent condition. Replacing them seemed like an extra step we didn’t need. a caulking tool – This tool won’t drip after release and is much easier on your hands than the cheaper ones. Begin by scraping off the old caulk. I love this a caulk scraper because it won’t gauge the wall or tile. Scrape or sand any excess nubby texture off to create a smooth surface. One trick to caulking any area is to cut the tip of the caulking gun at an angle. As you are caulking, hold the gun so that the tip is completely flush with the baseboard. Since I do a lot of caulking, getting a nicer gun with comfort grips that won’t drip after I set it down is really worth it. And that has got to be the worst caulk job I have ever done. I am holding a camera at the same time so you forgive me, right? I promise, it will all get smoothed out and it will be our little secret. If you aren’t comfortable with caulking, you can use specialty tape for Multi-surfaces. I have been in love with the clean lines that FrogTape gives me since I first discovered it while painting a racing stripe design in my son’s bedroom. I immediately noticed how much cleaner the lines were compared to other brands. Who wants to have to go back and touch up boo-boos from inferior tape? Ain’t nobody got time for that! Oh, I love a good reveal! Don’t you? Second pro-tip: skip all those fancy caulk tools and use your finger to smooth out the caulk. 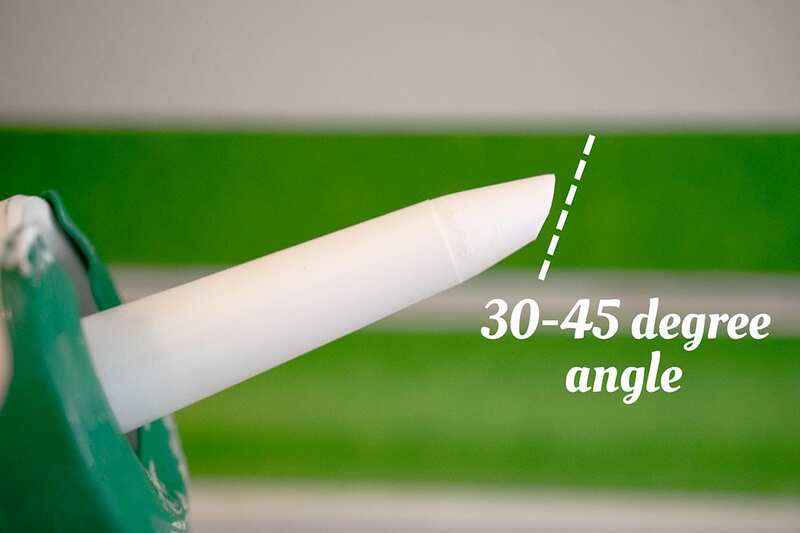 Use your index finger at an angle with light, but consistent pressure with your caulking gun in long swipes to get the best results. I usually caulk several feet and then wipe the excess off in one stroke. You want to press on the sides enough that you see the edges of the tape clearly before you tear it off. 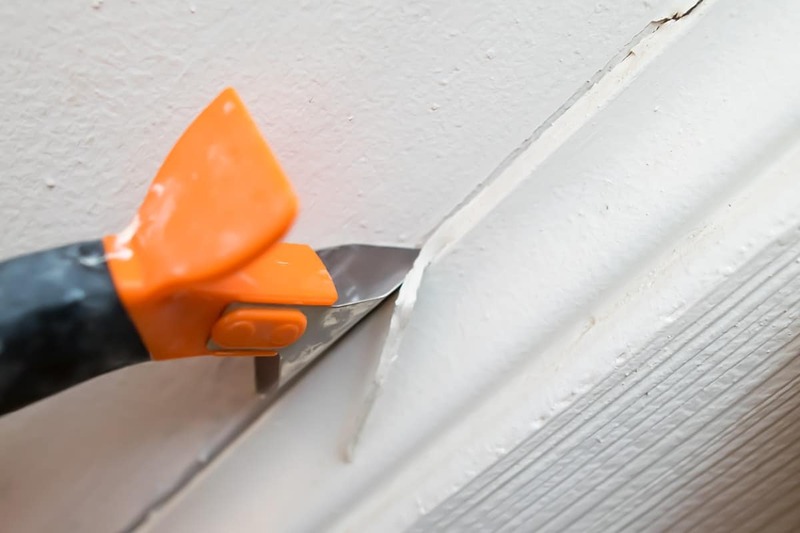 Peel off the tape immediately while the caulk is still wet. This is the mirroring staircase and it was in exactly the same condition before we repaired it. See what I mean? Those clean lines really look professional! 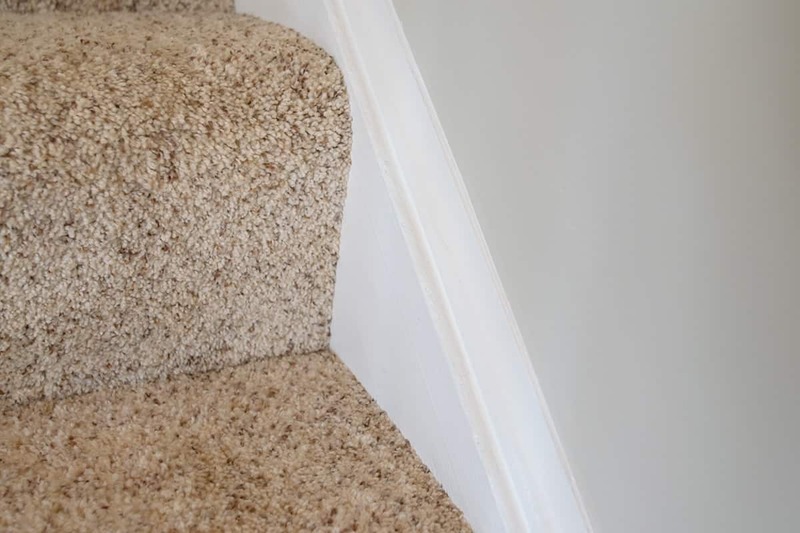 While we still have some work to do sanding and patching that wall, I wanted to share a few tips on making those baseboards and walls looks stunning and professional. I always paint my baseboards first because they are lighter in color. If you were using a darker color on the baseboards than on the wall, you may consider painting the wall first. I also find that taping the baseboards last provides an overall straighter line. I love the delicate surface tape for this purpose because it is made specifically for freshly painted surfaces. I even tape off the carpet to make it easier to paint the baseboards. Looking for More Simple Ways to Improve Your Home? Who knew baseboards could be this exciting?! You did an amazing job, looks fantastic! We’re working through a total redo of our “new” 1950 ranch. I’ve tried to caulk, and I have ALOT more to do. My problem is getting the tape straight! Try as I might, it’s always off. Since yours looks perfect, do you have any pointers for me? Any ideas would be greatly appreciated! Thank you and again, well done!!!! Good question and I completely get what you are saying. With baseboards or something like that, it’s not as big a deal to be super straight since it will be painted over anyhow. For me, I find that it works better if I pull about 18 inches or 2 feet of tape off the roll (but don’t cut it). I hope this makes sense. With one hand, I hold down the free end where it should be. Then I line up the other end attached to the roll, pull it tight, and get it about where I want it before pressing that end down. Then press and smooth out the 18 inches between them. Pull out another 18 inches and repeat. I usually do a whole wall with one piece of tape if I can. Working in larger sections I have always found to work better. Here is a video very similar to the technique I use: https://www.youtube.com/watch?v=CJ6HyFLfXV8 I also personally find it easier to make a straighter line by taping the bottom baseboards first, then following the line with the top tape. Same with painting. I usually paint my baseboards first and then tape off the baseboards for the wall. Hope that helps! I have a video on caulking bathtub surrounds coming next week with video, so there might be more tips and tricks there to check out. Rachel! Thank you for your fast response. It was so helpful and the video is great, what an eye opener on my incorrect technique 🙃 I really appreciate your help. Looking forward to the bathtub info. Thanks again! This is REALLY helpful. Thank you!! If you don’t want to get your finger dirty when you run it over the caulk, throw a rubber glove on it first or even a balloon! Just throw out when done. Weird question: I am going to paint our wood paneling and base boards. The base boards are just wood and have never been painted. Do you recommend caulking them after priming? Thanks! For the most part it doesn’t matter. Caulk sticks to tile which is much harder to stick to so it won’t be an issue. I might be inclined to do it with a little sanding if there is some sort of shiny or polyurethane coating on the wood, but I think it would be fine even if you didn’t sand. My house originally had wood baseboards that were stained and had polyurethane coating. The baseboards were not sanded and they were painted white. Now the painted is falling off in places. What do we need to do now before we paint the baseboards again? Unfortunately, the poly coating is preventing the paint from bonding properly. I am so sorry for such a mess! To make sure that you don’t have a repeat of that, you will want to sand the baseboards before applying a good quality primer. You don’t have to sand everything off, just enough to rough up the surface a bit and remove any sheen. Since you didn’t mention it, I suppose you don’t have any discoloration such as the stain bleeding through the paint, which is good. I still recommend a stain blocking primer as it will provide a good sticking barrier between the paint and any residual polyeurethane. I do really like this one, although I have used a similar Zinsser Product as well, but that was more for stain blocking properties rather than adhesion. While it does say you can avoid sanding with that one, I personally can’t guarantee that without seeing your specific project. I hope that helps and let me know if you have any more questions. Re: calking etc of stairs. I kept re-reading to see what you used tape for and how you applied it. Please? 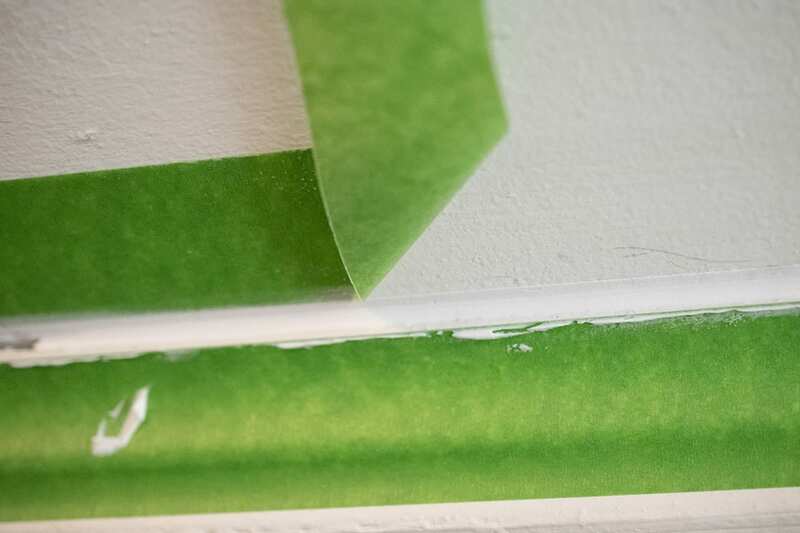 If you aren’t comfortable with caulking, you can use specialty tape for Multi-surfaces to create clean lines. It isn’t absolutely necessary, sometimes I use it and sometimes I don’t. It’s just how well you can smooth the edges into each side of the paint. If you look in the pictures above, the green tape running along each side of the crack where I caulked is the tape. I smoothed it out in one long piece from one end of the wall to the other before I started caulking. I hope that helps! I have had that tool for several years, so I am not completely sure where I bought it but I know you can get it on amazon here. Good luck with your project! Yes, the small details are the tedious ones but they make all the difference! Great post Rachel and thanks for sharing. 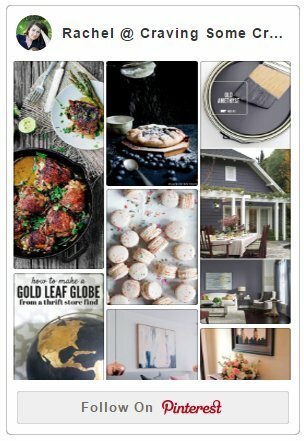 What color did you use on your walls in the last picture? I like it! Thank you! It’s from Valspar (at Lowes). I painted most of our house in Asiago and Oatlands Subtle Taupe. The Oatlands Subtle Taupe is the one on that wall. Interesting. I have never seen that before. I will have to check it out, thank you! Yep, never knew baseboards can be exciting like this. Fantastic idea indeed and your guide is very detailed and easy to follow. Thanks so much for sharing. Thanks for your tips. I’ll apply it to my house one day. Maybe I have to be very patient with the stairs because the number of scratches is uncountable. They appear everywhere along the stair. Even though they’re small, they look terrible in crowd. I had the same problem and many of the dents and scratches were filled with either wall patch or wood filler depending on what type of material was dented. In fact, when we purchased our house, we used over 5 gallons of wall patch to fix scrapes, holes, and scratches. It is tedious but the results are worth it. I need to try the tape before caulking trick! I hate caulking but it’s necessary. Pinned for later! Really good tips! Little details like this and repairing them make all of the difference. Great tips and Good job! Caulking makes all the difference! Oh my gosh! I definitely need to do this. My patience is thin, but the difference is beautiful! Fabulous job! It makes such a huge difference. Wow, what a difference a little caulk and paint make! I love Frog tape, and I gotta get me one of those caulk scrapers. I haven’t tackled out baseboards yet, but they are on my list! Just getting ready to do our doors, bathroom, and interior–I found your article in the nick of time. You’ve given me direction & hope! Thank U for a well-written article! !